Malvern’s People’s Light & Theatre presents Henrik Ibsen’s Ghosts running January 15th through February 9th, 2014 on the Steinbright Stage. Ken Marini directs. 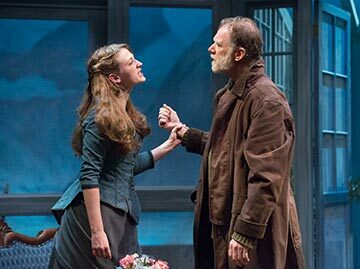 People’s Light & Theatre presents Henrik Ibsen’s Ghosts running January 15th through February 9th, 2014 on the Steinbright Stage. Ken Marini directs. Long-time People’s Light company member, Kathryn Petersen, will play Ibsen’s central character, Mrs. Helen Alving in Lanford Wilson’s acclaimed translation of Henrik Ibsen’s 1881 drama. Ibsen’s dark commentary on 19th century morality still resounds with contemporary relevance. Its scathing critique of doctrinaire family values and the constrained role of women in Victorian society echo present day social and political conversations. As its title suggests, it is also a compelling ghost story at heart and has contributed significantly – along with Peer Gynt, A Doll’s House, An Enemy of the People, and Hedda Gabler – to making Ibsen one of the most produced playwrights in the world, second only to Shakespeare. Henrik Ibsen has become known as “the father of Modern Drama.” Not only did he shock the world by dealing with taboo topics such as infidelity and venereal disease, but he also made the radical turn towards realism in the theater. Henrik Ibsen has become known as “the father of Modern Drama.” Not only did he shock the world by dealing with taboo topics such as infidelity and venereal disease, but he also made the radical turn towards realism in the theater. He introduced characters with psychological depth that spoke in natural conversational rhythms, details that we take for granted today. Although the magnitude of Ibsen’s legacy looms as large as the majestic fjords of Western Norway visible through the windows of the Alving estate, People’s Light co-founder Ken Marini will be directing Ghosts in the smaller of People’s Light’s two stages. 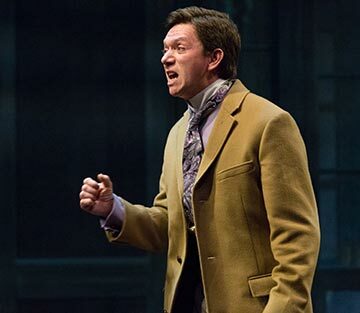 The more intimate environment of the Steinbright Theater will offer an opportunity to look closer and deeper at the maneuvering of the human heart and psyche, which is the work central to Ibsen’s artistry. Lanford Wilson’s translation of Ibsen’s original Danish text captures the detailed nuances of characters and relationships that made Ibsen so revolutionary in his time. As a Pulitzer Prize winning playwright for Talley’s Folly and one of the most distinguished American playwrights of the late 20th century, Wilson brings a great modern energy to this classic play. Ghosts previews on Wednesday, January 15 and Thursday, January 16 at 7:30 pm and Friday, January 17 at 8 pm. The play opens on Saturday, January 18 and runs through Sunday, February 9. Audiences are encouraged to join the artists for a conversation about the production after the Thursday performances on January 23 & 30 and February 6, 2014. People’s Light continues its program called Scoop on Sundays: History, Context, and Gossip, a lively discussion before every Sunday 7 pm performance (January 19 & 26, February 9). Resident Dramaturg Gina Pisasale will host an artist from the production and get the inside scoop about such things as the rehearsal and production process, design choices, and the world of the play. The program begins at 5:30 in The Farmhouse Bistro. Cost of $15 includes light fare. Single tickets: $26 – $46. For tickets, call the Box Office at 610-644-3500. Special discounts are available for groups of 10 or more. For more information or to purchase group tickets, call 610.647.1900 x111 or email wright@peopleslight.org. Enjoy a prix fixe dinner and a show package for $70 (Wed-Thurs) and $80 (Fri-Sun) at The Farmhouse Bistro prior to Wednesday-Sunday evening performances and save up to 15% off the single ticket price! If you already have tickets, you can add dinner for just $35. Dinner and a show packages are available online at PeoplesLight.org.